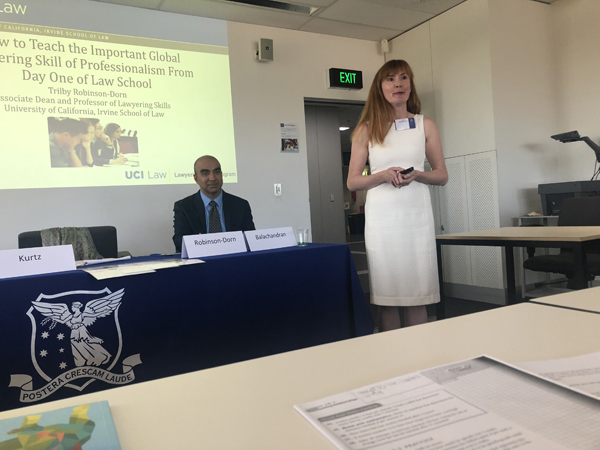 Associate Dean and Professor of Lawyering Skills Trilby Robinson-Dorn spoke in front of an international audience of law professors at the 2018 Global Legal Skills Conference in Melbourne, Australia on Dec. 11, 2018. Presented by the John Marshall Law School, the conference provided an opportunity for leading experts to share best practices of international legal skills education. The title of Prof. Robinson-Dorn’s presentation was “How to Teach the Important Global Lawyering Skill of Professionalism From Day One of Law School.” She was the sole representative from UCI Law at the conference, and one of three law professors from California to speak.